HELOC - What Does It Mean? 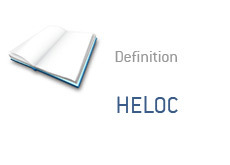 What is a "HELOC"? What is the definition of a "HELOC"? A HELOC is more commonly known as a Home Equity Line of Credit. In a HELOC, a homeowner borrows money (via a line of credit), and guarantees the loan with the built-up equity in their homes. A HELOC is also referred to as a home equity loan, secured loan or second mortgage. Practically all banks and lenders issue HELOCs, though they are a bit pickier since the implosion of the American real estate market. A HELOC involves adding a second bank or lender to your mortgage. The reason? You are providing the built-up equity in your home as collateral, and the bank in turn will be added to your mortgage. This is why HELOC interest rates are much lower than typical unsecured loans - the bank has some collateral, which means that they have less risk in the transaction. For instance, if you default on the loan, the bank can then recoup some or all of their money, as they are listed on your mortgage. For instance, let's say that a homeowner currently has $40,000 in credit card debt. They are paying 22% interest on this credit card debt. They also happen to own a home that is worth $400,000 and has a $250,000 mortgage outstanding. In this situation, the homeowner would be smart to take out a $40,000 HELOC using the equity in their home. They can then use this $40,000 to pay off their credit cards, and in turn pay a much lower rate of interest. HELOCs have declined in popularity over the past couple of years due to the rapid decline in the North American real estate market. At the height of the real estate boom in 2005, hundreds of billions of dollars were being loaned out via home equity loans. Since 2005, this number has declined sharply, as many people have a great deal less equity in their homes. A HELOC, when used properly, can be a great tool in terms of eliminating unsecured (and costly) debt.